A few days ago, I decided I wanted to dedicate a couple of days for myself. I had this list of things I wanted to do. One of the things on that list is to go shopping. 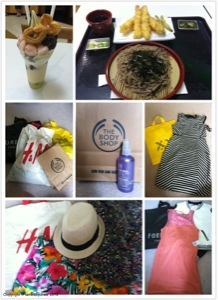 I haven't gone shopping in a long time, so yesterday I went to the mall with a friend. I was like a kid in a toy store. I got so excited with the things I was seeing. I finally got myself a letterman jacket, which cost me more than what I wished for, but it was worth it. I actually got a hat that I know I will wear; and a body mist I've been wanting to get for about a year now. All in all, I think they were good purchases. Granted I wouldn't have spent this much on a normal shopping day, but I think for now, I can live with it.